Beatriz talks about directing Brooklyn Nine-Nine's #MeToo episode and tells us why she believes a sitcom can be the right place to tackle tough topics. 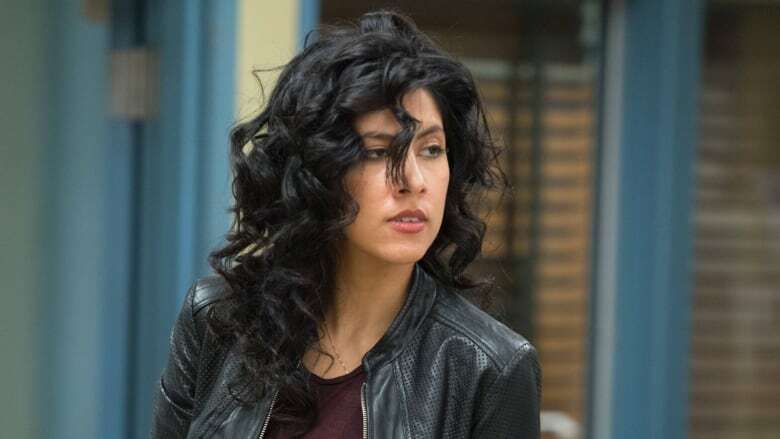 Stephanie Beatriz is the antithesis of her Brooklyn Nine-Nine character, the comically cold and deadpan detective, Rosa Diaz. Fans expect her to be the same stereotypical "tough guy," but instead, she's reflective and honest about her multifaceted character. "Underneath, she is a fully fleshed out, complex, sometimes very fragile person," she tells q's Tom Power. The comedian wants to use her passion to tell stories. Beatriz thinks that transforming into a different character brings them to life. "That's to me the ultimate goal," she says. "To disappear inside another character and bring them so fully to life that I've convinced other human beings that it's a real person." Bringing a real life perspective to her job, Beatriz opens up to Power about her own experiences as a bisexual Latina woman and how she's using comedy as a platform for tough topics. Brooklyn Nine-Nine was renewed for another season after it's cancellation in May, so Beatriz saw this as an opportunity to ask to direct her own episode. The highly-anticipated episode is centred around sexual harassment and the #MeToo movement. She says that the characters in the show are investigating a "he said, she said" case and things get difficult. Using the show to tackle tough topics, she reminds us watching that, "it's not just a women's issue — it is a human issue and it's, I think, really fascinating to watch these two characters sort of delve into this case and figure it out as they go." Beatriz thinks that comedy is the right place to discuss these complex issues. She says that comedy allows the audience to let the pressure out and forget that they might be in the middle of something really hard. "The audience is sometimes just holding their breath and they get that laugh and they release," she says. "And suddenly, we're going to figure it out together." She even brings this back to when she was researching for her first time role as a cop and speaking to real officers. She found that, even in these jobs, people are using humour to help them cope. "All of them told me they laughed a lot at work. And sometimes it was very dark, their humour, but they had to laugh," she says, "because otherwise they'd never make it through the day." You can catch Stephanie Beatriz every Thursday on Brooklyn Nine-Nine. The episode that she directed will air this Thursday on CityTV in Canada and NBC in the U.S. Produced by ​Vanessa Nigro and Katie Toth. Words by Enrica Ammaturo.